Here are some facts about the clothes and outfits worn by the Tudors. Wearing stylish and attractive looking clothes was very important to the wealthy during the Tudor period. Clothes were a form of status symbol and the rich demonstrated their wealth by wearing clothes made from expensive materials and fabrics. 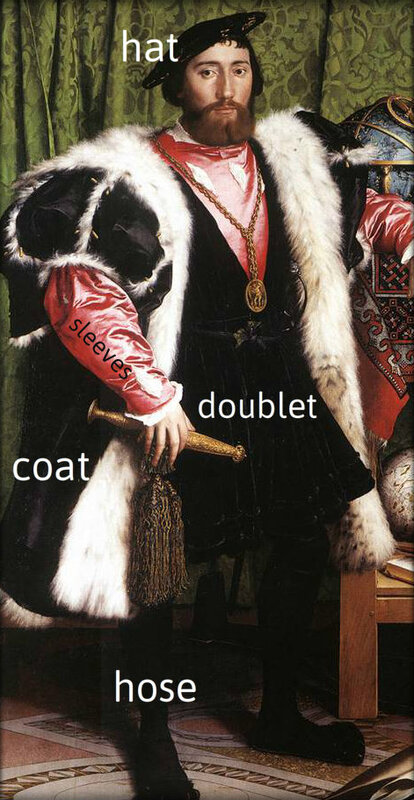 Although fashions changed and evolved during Tudor times, some popular items of clothing included dresses with long flowing trains, tight coats known as doublets, and a variety of different hats and cloaks. From the 15th century onwards, laws dictated what rich or poor people must wear. One law specified that on Sundays, all men except noblemen must wear a woolen cap. Tudor clothes were usually held together with lace or pins, and buttons were used only for decoration. Wigs were also popular with women, and when Mary, Queen of Scots was beheaded, it is said that her wig fell off. 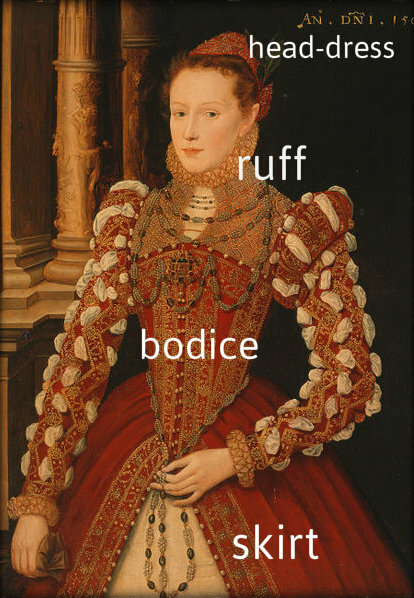 Neck ruffs (high frilly collars) were extremely popular throughout the Tudor period. Rich ladies also wore extremely tight fitting corsets to make their waists look as thin as possible. Make up was popular among rich Tudors and members of the Royal family, to indicate status and wealth. However, it also had a more practical use as it covered up scars caused by smallpox and other diseases. Queen Elizabeth I famously used make-up to whiten her face. The Tudors did wear underwear, but it was often uncomfortable and difficult to get on and off. During the reign of Henry VIII, the codpiece, was very popular with men. Women often had long hair long and they often wore it in a head-dress. Brides used flowers in their hair. A high forehead on women was regarded as a sign of beauty and intelligence. Tudor Kings and Queens wore clothes made from the most expensive materials, including satin, silk and velvet. They also liked clothing in gold, purple, and crimson and these colors were not allowed to be worn by the ordinary people. Rich Tudors wore jewellery made from silver, gold and various precious stones. Queen Elizabeth I apparently had a really sweet tooth and, as a result, some of her teeth went black. It is thought that some Tudor ladies painted their own teeth black so that it would appear that they too could afford to eat sugary items of food. Poor people in Tudor times wore simple woolen clothes. Men wore trousers (hose) and a tunic and women wore long dresses. The clothes worn by the poor were much more practical than those worn by the rich Tudors. Have a look at this video clip which provides details about some of the clothes worn by Henry VIII. What next? Discover more Tudor facts by visiting our Tudor resources page. I found this site informative and have always been interested in England royal history. I found this website useful because I am doing a project on Fashion.